I’m sitting out on the patio in the back yard just relishing the… the what? The now. I mean it’s not like it’s anything about what’s going on right now. We all have those moments where everything is perfect or something amazing is happening or just happened. Seeing Chicago in concert from the 6th row (when Peter Cetera was still lead singer none the less), Being at the Nebraska Oklahoma football game. Graduation, when the kids were born, when Janiece and I were married, those kinds of magical moments. None of that is going on. There’s not really an event or anything. It’s just one of those amazingly peaceful days where the weather is just perfect, the dogs are lying here by me, it’s just one of those moments you want to freeze and keep forever, not so much because of anything in particular other than it’s just that kind of moment. I know, a pretty pathetic attempt at describing it. That’s okay though, sometimes the best description is really more just recognizing there’s not a good description. They say that this is the kind of weather you get all the time in San Diego. I really do like San Diego, other than the crowdedness and traffic and cost of living. To be honest, I’m very content with the weather in Colorado. Winter’s not nearly as bad as I thought winter would be, I’ll take a Colorado winter over a Nebraska winter any time. Summer’s pretty awesome as I see it. It was a hotter summer this year but we don’t get a lot of this horrid stuff they call humidity. I’ll take 95 here over 80 in a very humid place (like Nebraska) any time. Which sounds like I’m knocking Nebraska a lot, truth is I loved it in Nebraska as well. Just not the weather so much. I got in my run this morning and it was glorious. 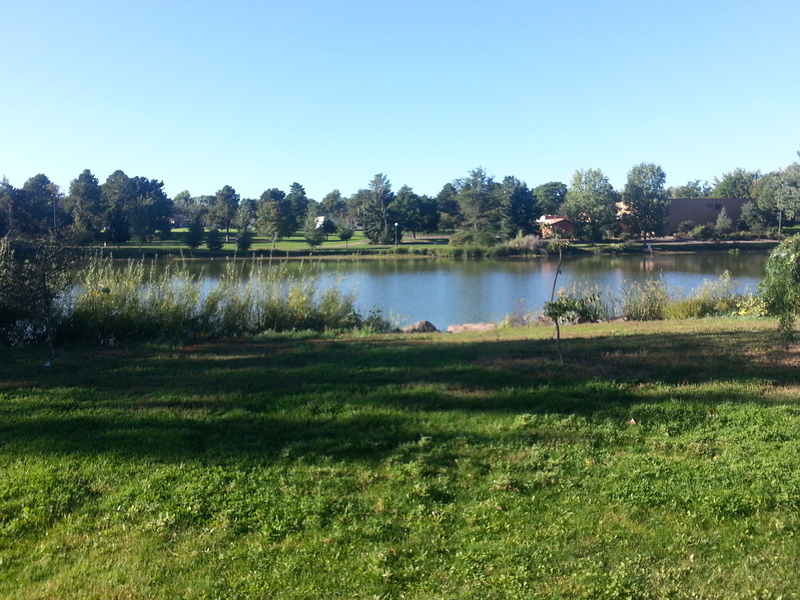 It was a simple run, 5 laps around the little lake at Harvey Park. It’s really a great little park, very peaceful and quiet, very pleasant. It’s a nice little asphalt track, not super crowded (except for the geese) and a bit more than 4/10 of a mile around the lake. It wasn’t that long ago I was so thrilled to be able to run once around that lake without stopping to walk. Okay, so I did stop one time today, long enough to take this picture. Leaves are just starting to turn with little hints of gold starting to show up. It was all stuff I’ve seen before lots of times but just one of those runs where it just felt good to run and just take everything in. Not that it was necessarily a perfectly blissful everything is perfect about the day kind of run. Knowing me, I did have to come up with a laundry list of complaints. I’m really unhappy about one change with the latest update on Endomondo, the app I use to track my runs. While I love, love, love my phone, it IS a battery hog, so I end up turning off things I’m not using such as GPS to get a bit more life out of the battery. It used to be that if I tried to start Endomondo without the GPS on it would warn me, It doesn’t do that any more, so I get done and find out that I ran for 42 minutes 48 seconds, but it doesn’t tell me how far I ran. And then, between Pandora and Sprint… blech. I haven’t been running with music much but today just felt like a good day for it. And Pandora was picking out some really awesome songs. But it would play a song, then be silent for 5 minutes before starting another. Now maybe it’s an improvment because it really gets irritating when it just stutters off and on through a song, and it looks like maybe now it just waits long enough to download enough of the song so it can play it without interruption. It’s just the waiting for the next song to be downloaded that is irritating. Sprint probably gets more blame though for that than Pandora because their data any more is pathetic. I mean really, really pathetic. Seriously, 7 years ago I was getting better speed and data performance than I do now. I know, I’ve measured it. Granted, I wasn’t competing with tons of smartphones for bandwidth. I’d been a big fan of Sprint phone service for awhile, I even worked for Sprint for awhile, and to this day I think they have the best plan and value out there. But they’ve got serious problems with their data right now. Which tells me I have some downloading to do if I want to listen to music for any part of the run next week. So see? I can be a pretty petty grumbler even on such a glorious day as this. The beauty though of such an incredible day is, when it’s all said and done you can just sit back, take in how incredible you feel on a day like this and realize that all that petty grumbly kinda stuff just really goes away. If you let it. Days like this make that much easier to do. This entry was posted in Uncategorized and tagged Awesome Day, Bear Chase, Colorado weather, half marathon, Pandora, relaxing, Running, San Diego weather, Sprint 3G. Bookmark the permalink.